Madeleine Masterson is deathly afraid of bugs, especially spiders. With very few options left, the parents of these four twelve year-olds send them to the highly elusive and exclusive School of Fear to help them overcome their phobias. 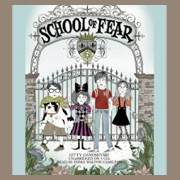 But when their peculiar teacher, Mrs. Wellington, and her unconventional teaching methods turn out to be more frightening than even their fears, the foursome realize that this just may be the scariest summer of their lives.